CLERMONT, Ky., Dec. 13, 2018 /PRNewswire/ -- Booker's® Bourbon, one of the few super-premium bourbons available uncut and unfiltered1, is proud to announce its final and most special release of the year – Booker's® 30th Anniversary Bourbon – celebrating the legacy of late Beam Master Distiller Booker Noe and the founding of his namesake brand three decades ago. Widely credited with the creation of the small batch movement, Booker's 30th Anniversary Bourbon celebrates not only the mark Noe left on the Beam family of brands, but the impact he had on the whiskey industry as a whole. Released in extremely limited quantities, Booker's 30th Anniversary Bourbon features a mingling of uncut, unfiltered1 9-year-old and 16-year-old Kentucky Straight Bourbon whiskies, which together present robust flavor with the brand's signature notes of vanilla that Noe preferred in his namesake whiskey. Bottled at 125.8 proof, these barrels were aged specifically with Booker's legacy in mind under the watchful eye of 7th Generation Master Distiller and Booker's son, Fred Noe. "It's a great honor to release Booker's 30th Anniversary in commemoration of my Dad and the path he paved when he introduced the world to Booker's Bourbon," said Fred Noe. "When we first started talking about an anniversary batch, I knew it would have to be something special, and during my final tasting of this extra aged liquid, I knew Dad would have been pleased. I'm proud to carry on his legacy every day and to share this special release in honor of the damn fine whiskey he created 30 years ago." In the late 1980's, Booker Noe set out to create his version of the perfect whiskey – one that offered a full-bodied taste profile, aged between six and eight years, bottled at its natural proof with robust flavors of vanilla. What started as a personal, holiday gift that Booker would share with close family and friends turned into one of the industry's most influential super premium bourbons. To this day, Booker's Bourbon is considered by many, the industry's first small batch bourbon which contributed to the bourbon movement our industry still enjoys today. A robust and powerful bourbon, Booker's 30th Anniversary is itself a reflection of Booker, the man. His legacy is also honored in the details of the packaging. 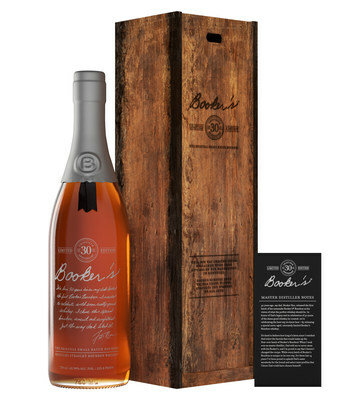 Each bottle of Booker's 30th Anniversary is topped with a special silver wax then packaged beautifully in a box made of reclaimed wood from the very rackhouses where Booker once walked as he selected his personal batches of Booker's Bourbon. Tasting Notes: The taste profile of this bourbon is lighter than most batches of Booker's, with a quick, dry finish that does not overpower your palate, and offers robust notes of vanilla and oak from the mingling of whiskies present in this release. Sipping Suggestions: Booker's 30th Anniversary is best enjoyed neat, over ice or with a few drops of water. Booker's 30th Anniversary Bourbon is now available nationwide in extremely limited quantities with a Suggested Retail Price of $199.99 for a 750 mL bottle. Along with the limited release of Booker's 30th Anniversary, four Booker's batches were also released throughout 2018 as part of the annual batch collection, with each release named in tribute to the people, places and pastimes that were important to Booker. The 2018 collection included Batch 2018-01, "Kathleen's Batch," Batch 2018-02 "Backyard BBQ;" Batch 2018-03, "Kentucky Chew™;" and most recently, Batch 2018-04, "Kitchen Table." For more information about Booker's Bourbon and Booker's 30th Anniversary Bourbon, please visit us at BookersBourbon.com. Booker's® Bourbon was inspired by a 200-year-old family tradition and came to life when Booker Noe selected the first bottles of Booker's as holiday gifts for his friends and family. With its instant popularity within Noe's close circle, Booker's Bourbon was soon after bottled and made available on shelves for everyone to enjoy. Booker's Bourbon is one of the only bourbons bottled straight-from-the-barrel at its natural proof, which varies from batch to batch. It is crafted in small batches and aged for six to eight years in charred oak barrels, which are stored in the center of the rack house. Today, Fred Noe personally tastes and selects every batch of Booker's Bourbon to ensure every bottle contains a robust, full-bodied whiskey that has a taste, aroma and proof that matches Booker's whiskey preference. As a world leader in premium spirits, Beam Suntory inspires human connections. Consumers from all corners of the globe call for the company's brands, including the iconic Jim Beam and Maker's Mark bourbon brands, Suntory whisky Kakubin, and Courvoisier cognac, as well as world renowned premium brands including Knob Creek and Basil Hayden's bourbon, Yamazaki, Hakushu and Hibiki Japanese whiskies, Teacher's, Laphroaig, and Bowmore Scotch whiskies, Canadian Club whisky, Hornitos and Sauza tequila, EFFEN and Pinnacle vodka, Sipsmith and Roku gin, and Midori liqueur. Booker's® Kentucky Straight Bourbon Whiskey, 60.5%-64% Alc./Vol. ©2018 James B. Beam Distilling Co., Clermont, KY.
1Booker's® Bourbon is quality screened to remove only pieces of charred barrel wood from the liquid.